Sat down with the owner of my LYS today and worked out my teaching schedule through December. And since I was the first one in, I got all the dates and times I wanted. Hooray! Now I just need to finish making the samples and get them in the shop before the middle of August. 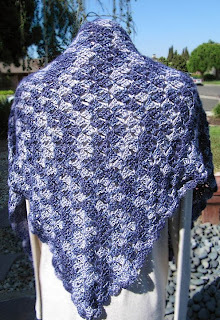 The (not)Beaded Wrap is finished and had its photo shoot today. 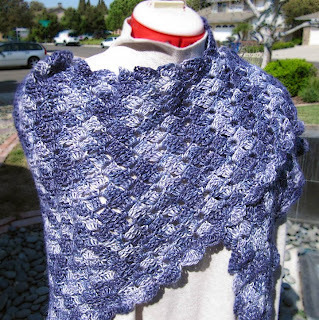 I've made it before with the beads, as per the pattern, but this time I wanted a simple shawl to wear with jeans. The alpaca is a little prickly, but overall I'm pleased with this. 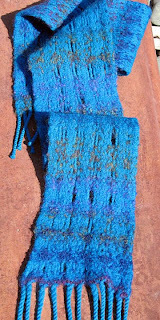 I also finished another woven felted scarf in class Tuesday night. I got it warped, woven and half the fringe twisted in the 3-hour class. 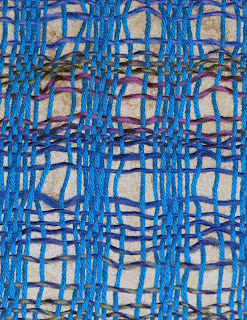 Rigid heddle weaving is FAST - and so is the felting. This was in the washing machine for only 3 minutes - I had the stopwatch out, checking the progress every minute - and the scarf itself is well felted. Unfortunately, it wasn't quite long enough to thoroughly felt the twisted fringe. 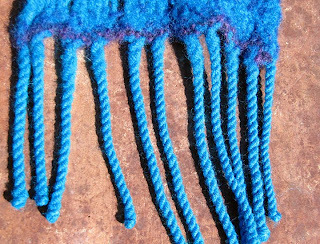 I'm debating handfelting just the fringe in a sink of hot, soapy water. I love how soft this scarf is . . . and hope the recipient will like it too.